(Cherbourg, France)- The 2018 edition of the FISU World University Sailing Championship will be taking place from August 30th to September 6th on the inner harbor of Cherbourg, France. The event is being hosted by YC de Cherbourg and supported by the FISU (International Federation of University Sports), World Sailing, and FFV (French Sailing Federation). The YC Cherbourg PRO will be Roland Galliot from France with real-time, on-the-water umpiring of all races. 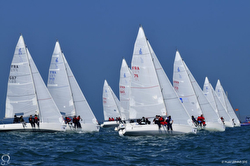 A total of nineteen teams are participating from ten nations, all racing a matched fleet of J/80 one-design sailboats supplied by the organizers. The Open Division includes the following nations and number of teams: Australia (2), Austria (1), China (1), France (2), Italy (1), Japan (1), Netherlands (1), Singapore (2), South Korea (1), Spain (2). In the Women’s Division, the following nations are participating: France (2), Netherlands (1), Singapore (1), South Korea (1). 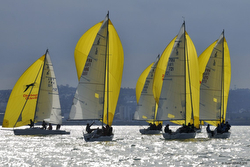 There will be an overall World University Sailing Champion for all teams participating. In addition, there will be a Nation’s Champion for the best combined scores of the Open and Women’s Division, plus there will be a Women’s Champion trophy. Watch the introductory World University Sailing Championship video here on YouTube For more FISU World University Sailing Championship information Add to Flipboard Magazine.